This looks good, I like peanut butter and Lyn likes chocolate. What do I hear Lyn saying honey could you…..
For a decadent low-calorie dessert, check out this Peanut Butter Swirl Brownies recipe. 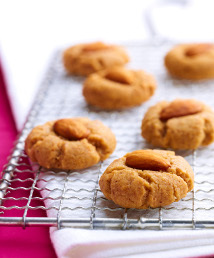 Only 162 calories per serving, this treat uses reduced-calorie margarine, brown sugar, egg substitute, and 25% less-fat peanut butter. Combine margarine and brown sugar in a medium bowl; add egg substitute. Beat with electric mixer on medium until thoroughly combined. Add vanilla; beat well. Combine flour, baking powder and salt; add to sugar mixture, stirring well. Divide batter in half. Stir cocoa into one half; stir peanut butter into other half. (Peanut butter mixture will be thick. Spoon dollops of each batter alternately into a 9-inch square pan coated with cooking spray. Cut through batters in pan with a knife to create a swirled pattern. Bake at 350°F for 25 minutes or until a wooden stick inserted in center comes out clean. Remove from oven, and let cool completely on a wire rack. I remember as a kid we used to go to Auntie D’s house to make pies. 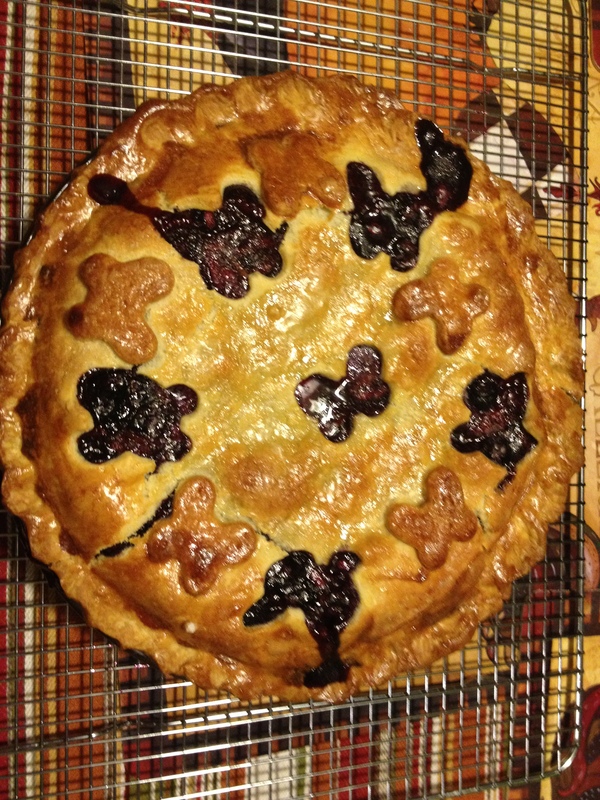 The adults, under her direction, would all be busy making pie after pie Apple, Blueberry, mixed berry…….. she was and still is in everyone’s mind the measuring stick when it came to pies. Across the street there was a path in the woods, long since taken over by development, to the cranberry bogs and along the way was a gold mine of blueberry bushes. Big fat blueberries all there for the picking. Now this was the important job of the kids fill the buckets and eating our fill. The thought of one of her pies after dinner kept us under control and the buckets returned full. A few years back my wife and I went blueberry picking in Beebe Woods and quickly retreated because of the immediate and massive horse fly attack we fell to. That sure took the romanticism out of picking, there they were bushes, branches plump with hundreds of blueberries under the guard of a flying army. We did find the nearest convenient store and sprayed ourselves but it was just not the same. Anyway I babble…..Joe and I were talking about me buying 4 cases of blueberries from Wholefoods when they had them organic $1.99 a pint. I froze some, made some blueberry syrup, jam, Lyn made muffins and probably bread but mostly I would throw a handful in my morning oatmeal taking advantage of the memory boosting powers of blueberries. 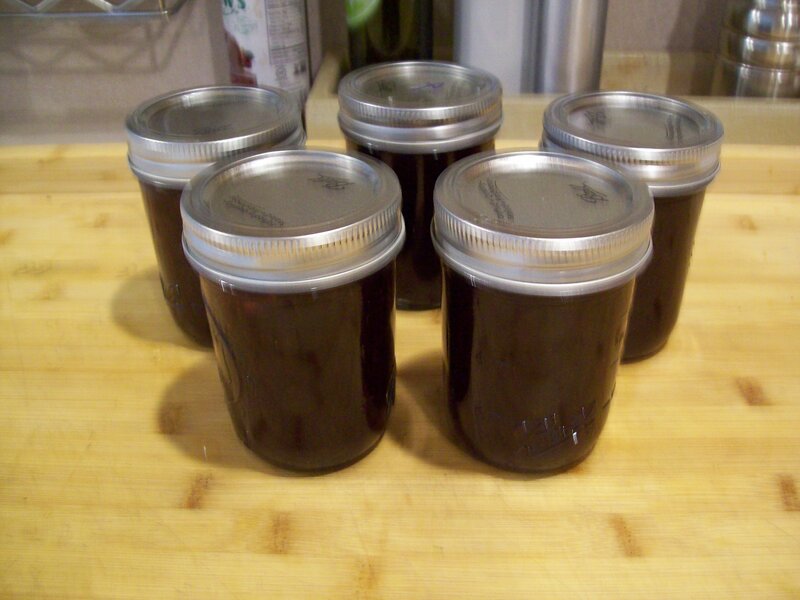 They are gone except for a bottle or two of the syrup and I am staring to have trouble remembering why I started writing this only kidding….so hear ya go Joe’s Blueberry pie. Cooks Illustrated Published July 1, 1995. Makes one 9-inch pie, serving 6 to 8. For many years we have tried using flour and cornstarch to thicken fresh fruit pies, but the results have been uniformly poor. After testing cornstarch, flour, tapioca, and arrowroot, we found that the samples of fruit thickened with the root starches, arrowroot and tapioca, were clear and bright in appearance and had the clearest fruit flavor. Of the two, tapioca showed a bit more thickening power and was therefore our favorite. So we developed a fruit pie recipe employing this favorite. 3. Remove dough from refrigerator; let stand at room temperature to soften slightly, about 10 minutes. Heat oven to 400 degrees. Toss fruit with sugar, lemon juice and zest, spices, and tapioca; let stand for 15 minutes. When making our blueberry pie filling, we found that if we used more than 2 tablespoons of tapioca, the texture of the filling took on a gummy consistency we didn’t like. But 2 tablespoons or less resulted in a filling that was too loose. Could we solve this problem with pectin, a gentle thickener that occurs naturally in fruit? As expected, the pie thickened with tapioca alone was loose and soupy. But the pie thickened with tapioca plus an apple had a naturally gelled texture that was just right. The apple bits seemed to melt into the berry filling during baking, boosting fruity flavor but leaving no textural sign of their presence. Pectin is a natural substance, found in fruits and vegetables, that creates structure in a plant by helping to bind its cell walls together. This same substance is used to thicken jams and jellies into a set, but soft, mass. Pectin content varies from fruit to fruit and also within a plant (more pectin is found in the skin of a fruit than in its flesh, for example). Apples are a great source of pectin because they contain high levels of high-methoxy pectin, the best natural pectin for making gels. By mashing some of the blueberries and grating the apple, we helped to release the pectin from the fruits’ cell walls so that it could thicken the pie filling. Pie filling thickened without enough tapioca won’t firm up. But too much tapioca leads to gumminess. A little tapioca plus a grated apple created a juicy but sliceable filling. Lyn got to choose 2 of her meals that are not from her strict diet this week, she reached her half way goal and that is what they do for you at that point. Let you taste real food as she calls it. Heck, it is working, every week she losses a pound or more and that is the good way it stays off. Now I like her just the way she is but get a Yes Dear look if I say something. Anyway she chose Pan Seared Sea Scallops but whole foods also had Haddock on sale and while surfing the net she found this recipe. As I am not that adventurous when it comes to fish, Haddock should be fish and chips, swordfish and tuna steaks should be grilled, salmon well there are a lot of ways that my palate has been introduced to so when she showed me this recipe I said why not give it a try on Sunday. It was our pregame meal which turned out to be disappointing, the game not the meal this was light, flaky and just right. Cut fish into 3 x 2-inch pieces. Rinse fish; pat dry with paper towels. Cover and chill until needed. Preheat oven to 425 degrees F. Line a large baking sheet with foil; lightly coat with nonstick cooking spray; set aside. For chips, pat potatoes dry with paper towels; place sweet potatoes in a large bowl. Add olive oil, Old Bay seasoning, 1/2 tsp. chili powder and 1/2 tsp. salt. Toss to coat. Arrange potatoes in a single layer on one half of the prepared baking sheet. Bake for 10 minutes. Meanwhile, for fish, place milk in a shallow dish. Place flour in another shallow dish. In a third shallow dish combine bread crumbs, 2 tsp. chili powder, paprika, 1/4 tsp. each salt and pepper. Add melted butter; stir until combined. 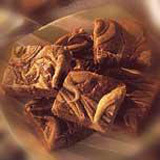 Dip fish pieces in milk; coat with flour. Dip again in the milk, then in the bread crumb mixture. Remove baking sheet from oven. Using a spatula, carefully turn potatoes over. 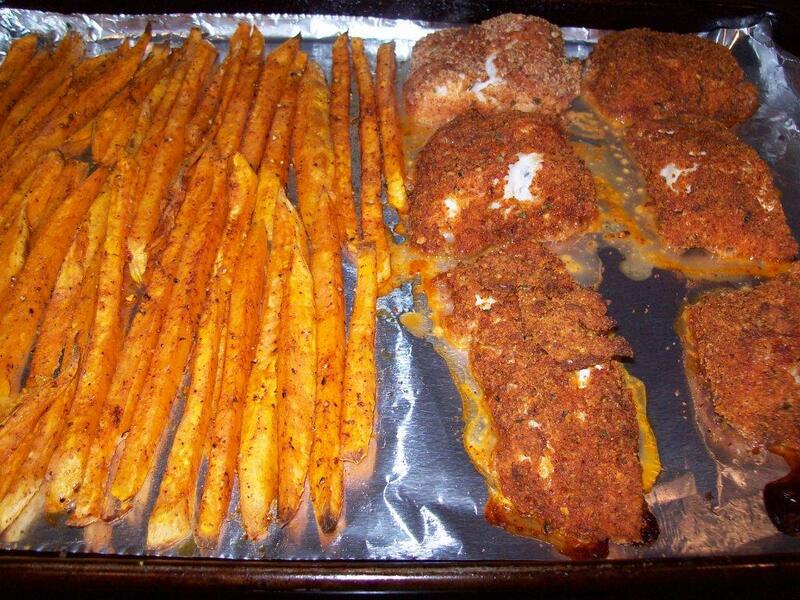 Place fish on the other half of the hot baking sheet; return to oven. 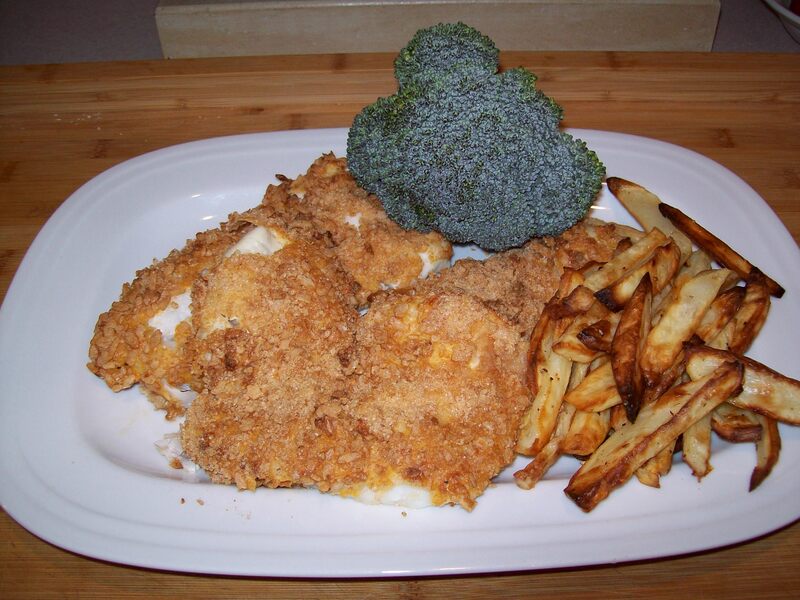 Bake for 10 to 15 minutes more or until potatoes are golden brown and fish flakes easily with a fork. Serve fish with lemon wedges and fresh parsley, if desired. 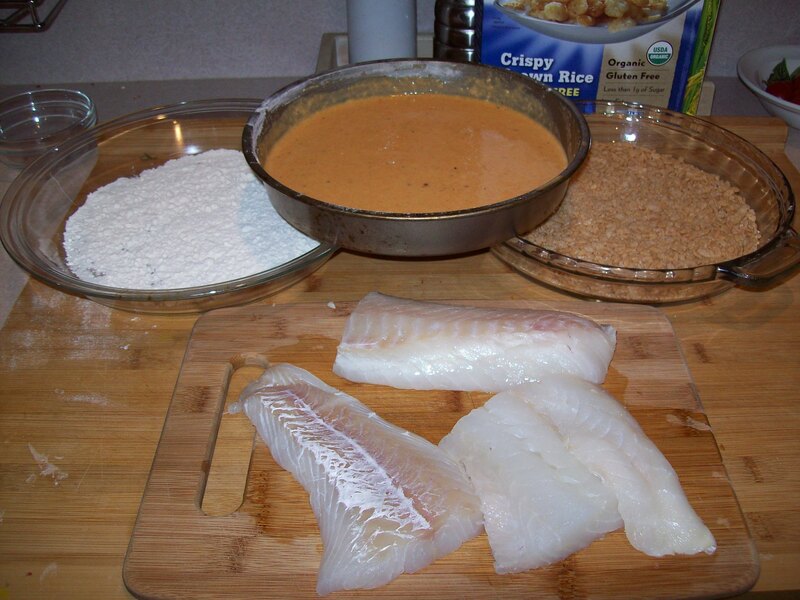 Cut fish, prepare milk flour and bread crumbs. 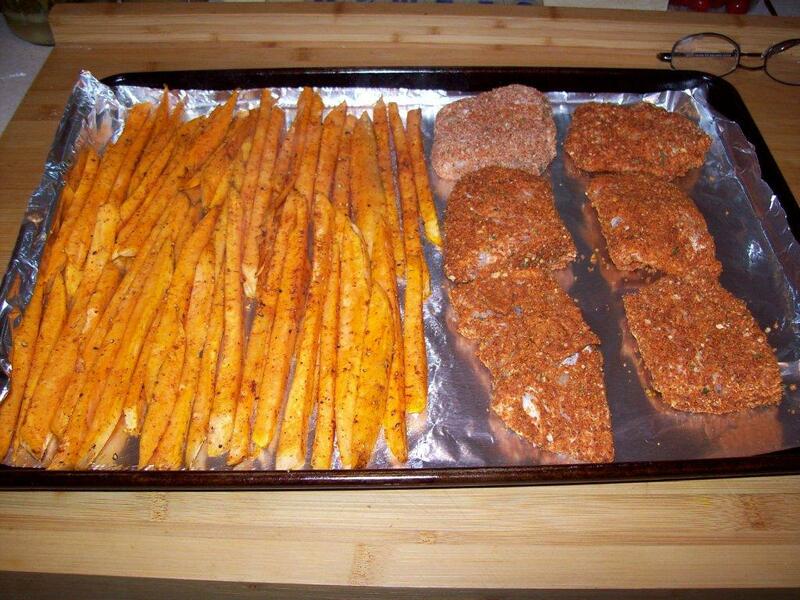 Place the sweet potato fries in oven on 1/2 cookie sheet. Add the fish to the other half of cookie sheet and return to oven. I know she got these out of a natural health magazine many years ago and that these are good, real good, that’s all I will write. Smell the almond. Blanch the almonds in boiling water for 45 seconds. Drain and rinse under cold running water, squeeze each almond to pop it out of its skin; transfer almonds to cookie sheet and toast in the oven for 8 minutes. Sift the flour, baking soda, and salt together in a bowl. In another bowl, whisk together maple syrup, almond butter, melted butter, vanilla and almond extracts and orange zest until smooth. Fold the flour mixture into the almond butter mixture. Form the dough into walnut sized balls. Place the balls 3 inches apart on the backing sheet and gently flatten into 1 ½ inch rounds. 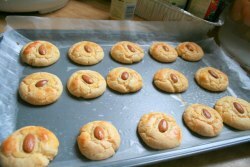 Press an almond into each cookie. Bake for 15 to 18 minutes, rotating the baking sheets halfway through for even baking. Transfer the cookies to a wire rack to cool until crisp. Almonds are not nuts. 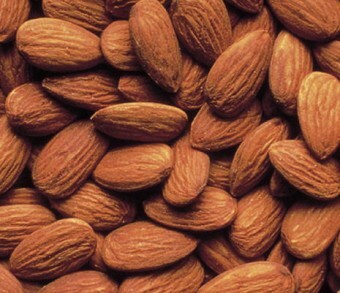 In fact, an almond is the seed of the fruit of the almond tree. This tree bears fruits with a “stone-like” seed within. 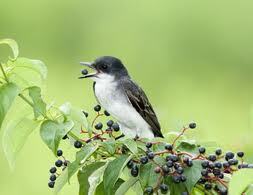 When midsummer rolls in just before the birds and chipmunks decide that their buffet is ready we grab what we can and make one of our old time favorite’s deserts, snack sometimes even breakfast. This has been one of our staples since 1991 the good thing is you choose the berries to change it up. I have tried nets and sprays but nothing really helps so with the berries, as with my garden the year before, I decided to share. If only they understood the concept. This year I only did a deck garden leaving the ground level for my herbs. 1. Wash and hull strawberries. Mash 1/4 of them with 3/4 cup of the sugar. Cut the rest in half or quarters. Combine mashed and cut up strawberries with raspberries and blackberries. Set aside. 2. Heat oven to 400 degrees. 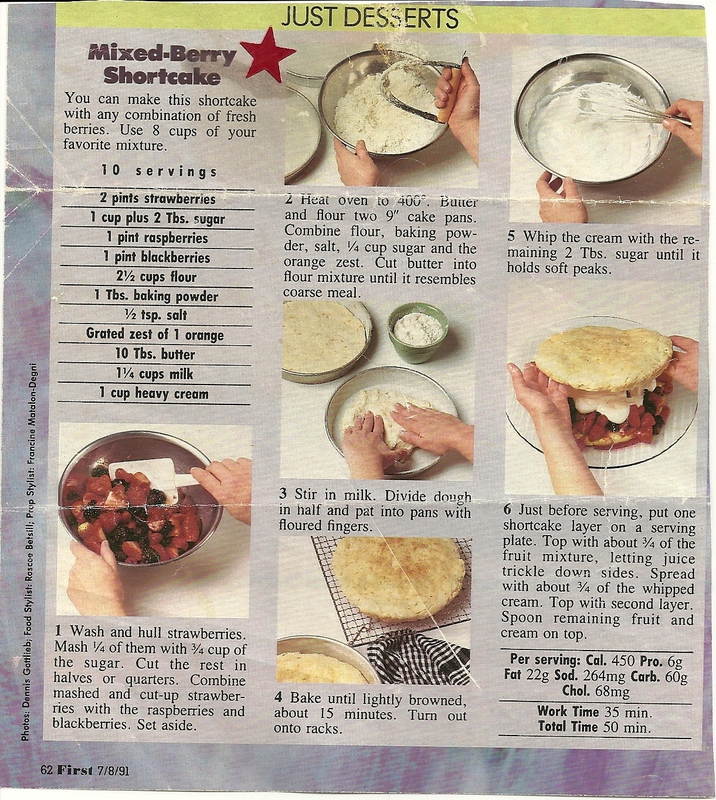 Butter and flour baking two 9″ cake pans. Combine flour, baking powder, salt, 1/4 cup sugar and orange zest. Cut butter into flour mixture until it resembles a coarse meal. 3. Stir in milk. Divide dough in half and put into pans with floured fingers. 4. Bake until lightly browned, about 15 minutes. Turn out onto racks. 5. Whip the cream with the remaining 2 Tbsp sugar until it holds soft peaks. We used to pan fry our fish all the time placing an halved onion in the oil to absorb what we were told would be the fish odors. Then we slowly got healthier and were delighted when surfing the channels came upon Americas Test Kitchen and they were making this tried it and now it is a staple. We had baked fish before but it never really came out crispy or stuck to the fish. Who would have thought a skinny nerdy looking guy, Chris Kimball, would become one of my heroes although he does not seem to cook much, so I guess my real heroes are Julia, Bridget, Rebecca and the rest of the crew. He does pull it all together and I am sure he is a fine cook and not how he depicts himself on the show. Please keep inspiring and educating me. Published September 1, 2008. From Cook’s Illustrated. Adjust oven rack to middle position and heat oven to 350 degrees. Pulse bread, melted butter, 1/4 teaspoon salt, and 1/4 teaspoon pepper in food processor until bread is coarsely ground, eight 1-second pulses (you should have about 3 1/2 cups crumbs). 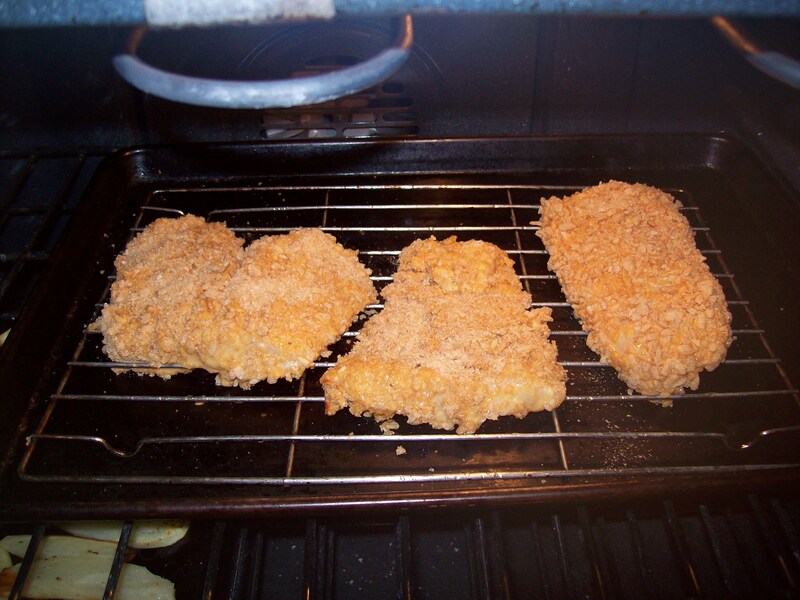 Steve tweak: Use already prepared whole wheat or panko bread crumbs added salt and pepper and then melted butter. Transfer to rimmed baking sheet and bake until deep golden brown and dry, about 15 minutes, stirring twice during baking time (0-8 minutes using bread crumbs). Cool crumbs to room temperature, about 10 minutes. Transfer crumbs to pie plate; toss with parsley and shallot. Increase oven temperature to 425 degrees. Place 1/4 cup flour in second pie plate. In third pie plate, whisk eggs, horseradish (if using), mayonnaise, paprika, cayenne pepper (if using), and 1/4 teaspoon black pepper until combined; whisk in remaining 5 tablespoons flour until smooth. Spray wire rack with nonstick cooking spray and place in rimmed baking sheet. Dry fish thoroughly with paper towels and season with salt and pepper. Dredge 1 fillet in flour; shake off excess. Using hands, coat with egg mixture. 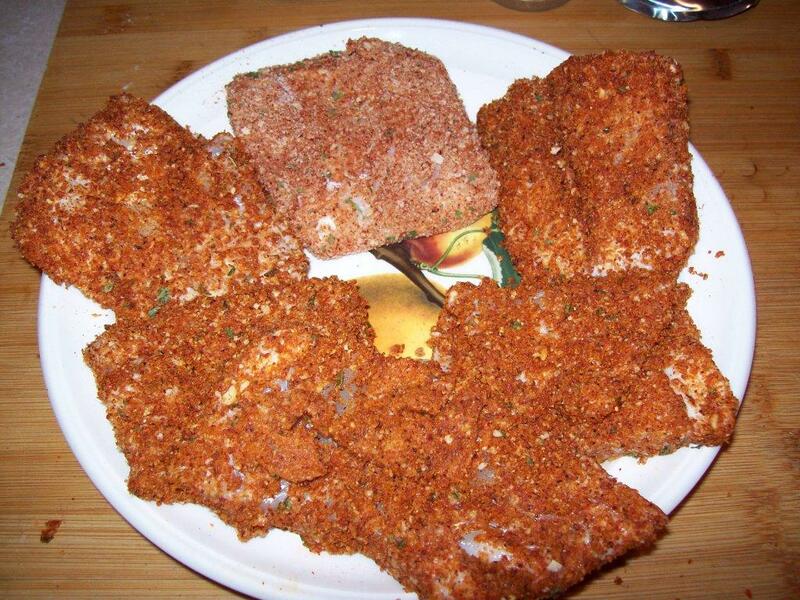 Coat all sides of fillet with bread crumb mixture, pressing gently so that thick layer of crumbs adheres to fish. 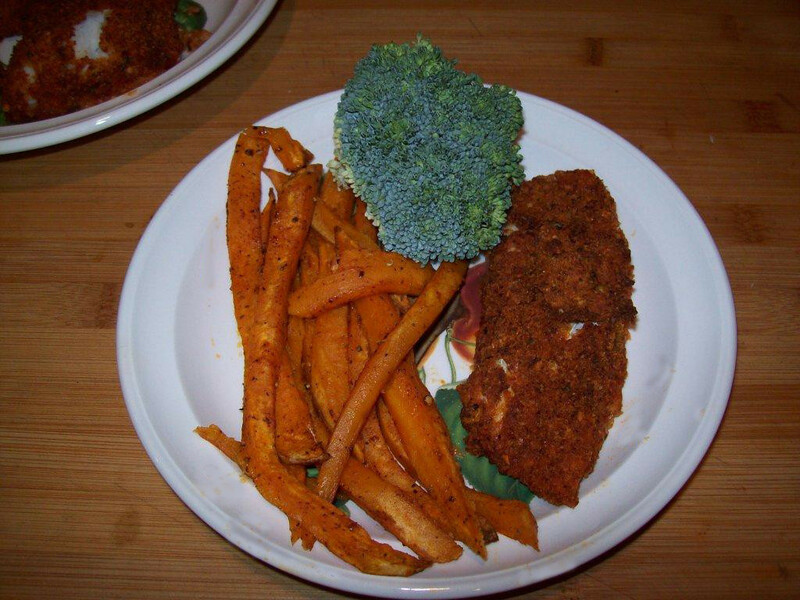 Transfer breaded fish to wire rack. Repeat with remaining 3 fillets. 4. 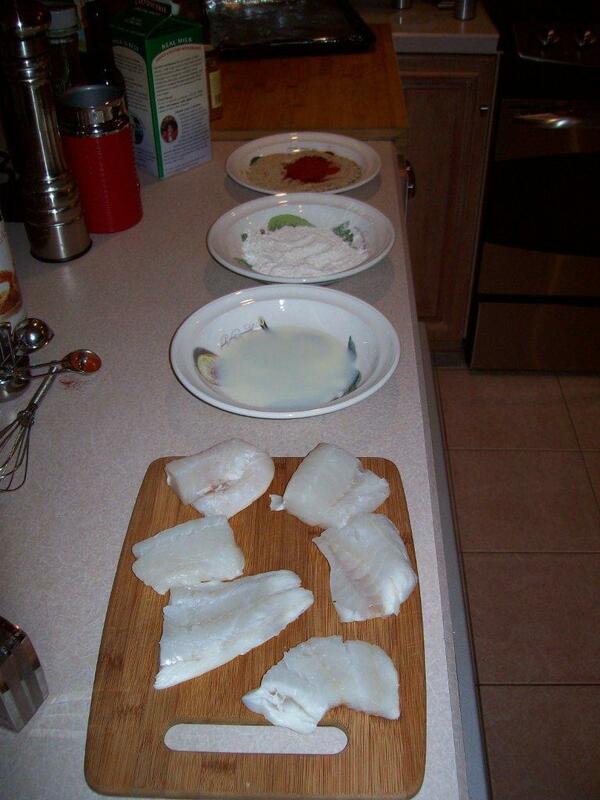 Bake fish until instant-read thermometer inserted into centers of fillets registers 140 degrees, 18 to 25 minutes. Using thin spatula, transfer fillets to individual plates and serve immediately with lemon wedges. 1. Pulse: Processing fresh crumbs very coarsely maximizes crunch. Steve tweak: Use already prepared whole wheat or panko bread crumbs added salt and pepper and then melted butter. 3. Dip: Thickening batter with flour and mayonnaise prevents toasted crumbs from turning soggy and glues them firmly to fish. 4. Coat: Pressing down gently on crumbs helps to pack thick layer on fish. 5. Elevate: Baking fish on a wire rack set inside baking sheet allows air to circulate underneath.